Enjoy the Museum with your children. Here are some tips for preparing your visit, including recommendations, resources and practical information to ensure that both the adults and the children have an enjoyable experience. Find out what you can see at the Museum. 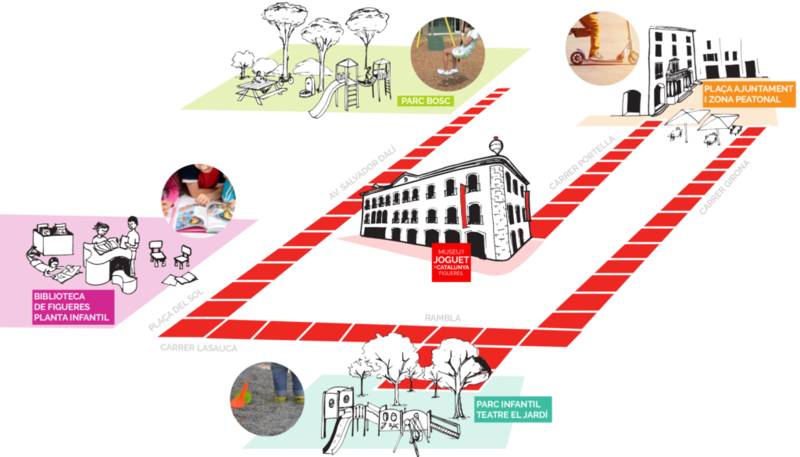 Find out about our activities and exhibitions. Talk to the children about the Museum and the things they can see here. Talk to the children about the behaviour guidelines at the Museum. Enjoy the games in the permanent exhibition rooms and the Games Room. Talk to the children about what you have seen and ask them what they liked best. Encourage them to talk about it with their friends and at school. You can continue to spend time at the children’s play areas near the Museum and visit the Children’s Room at the Fages de Climent Public Library. Take a stroll around the area near the Museum. Follow the Museum’s events and day to day activities on social media. Is admission free for children? Admission is free for children aged up to 5 years old. Admission is reduced for children aged between 6 - 16. Is it possible to park near the Museum? There are several car parks very close to the Museum. Click here to see their location. Can we have lunch with the children at the Museum? The Museum does not have a restaurant. Ask the staff at the visitor reception desk about local establishments that will welcome you and your children. Can we visit the Museum rooms with prams and pushchairs? The Museum rooms can only be visited with prams and pushchairs if authorised by the reception staff. Depending on the volume of visitors on the day of your visit, you may be required to leave pushchairs in a designated area at the Museum entrance. Can children draw and colour in the Museum rooms? Yes, as long as they use pencils. Pens, markers and crayons must not be used in the Museum. Yes. Ask the customer service staff where they are located. Can children’s birthday parties be held at the Museum? Figueres. Child Friendly City, 2016-2020.